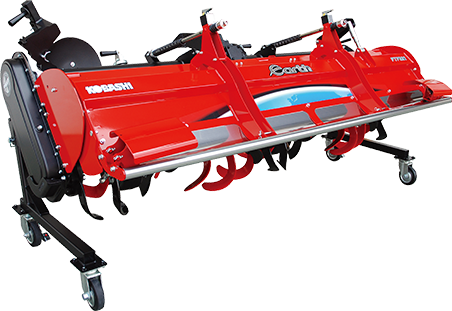 Kobashi Earth-series Rotary Tiller Suitable for crop conversion. ・Suitable for both rice paddies and dry fields. 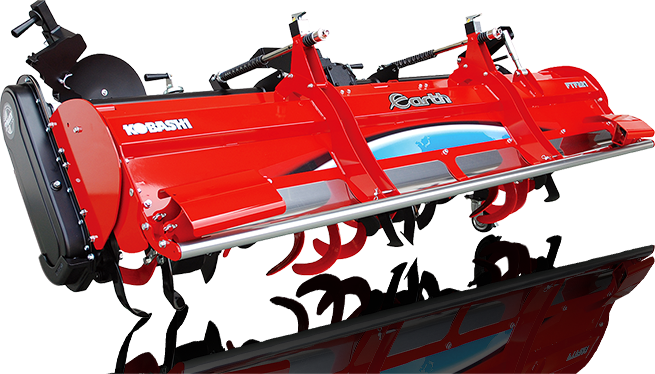 The Kobashi Earth Series Rotary Tiller is excellent for effective tillage of both rice paddies and sowing bed for crop conversion. 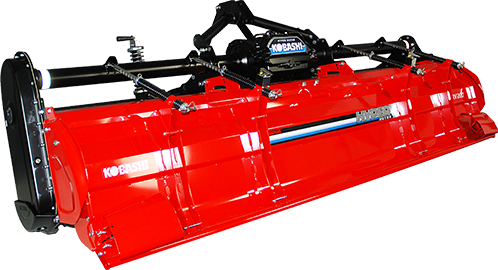 This rotary tiller (FTM, L, and X Series) is equipped with dedicated tiller-blades for plowing-in, “side-disks” to secure depth of tillage, “rakes” to reinforce plowing-in, and “rear hitch” to place seed planter. The Earth Series (FTF, E, and V) offers exceptional ease of maintenance with its “Vibrio-wave Cover” and “Quick-Assist” equipment. Excellent for tillage and soil preparation with a large-sized tractor (up to 117.7kw). Satisfaction guaranteed with an poweful tillage tool. The Hyper Rotor(Japanese-English) is a standardized series of Kobashi rotary tillers, designed for use with medium-sized and large-sized tractors. Equipted with “Hyper Z-blades,” it takes advantage of its outstanding Kaiteki-blades. With a unique arrangement of tiller-blades, the Hyper Rotor is a powerful tool that achieves the maximum effect out of available tractor-power. Copyright(c) 2017. KOBASHI INDUSTRIES CO.,LTD All Rights Reserved.